A Smart Safe Cash Management Solution for Retailers, CIT's and Financial Institutions. 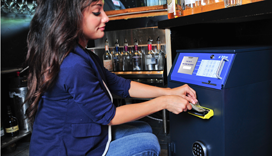 The VersaSafe is a remarkably fast, secure, and accurate smart safe system for cash-intensive environments. 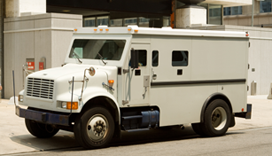 Retailers can quickly secure cash and dramatically reduce both internal and external theft by eliminating cash touch points, while optimizing armored car carrier visits. 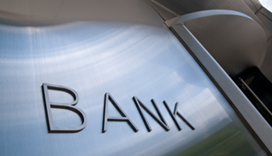 The VersaSafe, combined with VersaLink, can facilitate provisional credit and enhance reconciliation, while reducing the float time associated with cash deposits to less than 24 hours. 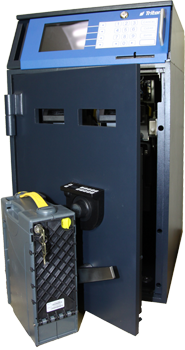 Features up to two bill acceptors with non-locking 1,000-note cassettes. 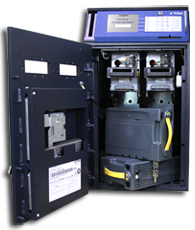 Features up to two bill acceptors with locking 1,200-note cassettes and can optionally be fitted with bunch note feeders. 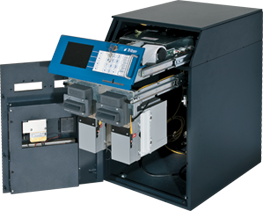 Features up to two bill acceptors with locking 2,200-note cassettes and can optionally be fitted with bunch note feeders. The VersaSafe allows retailers to spend less time counting, reconciling, and banking money, resulting in more time on the sales floor. Retailers can quickly and accurately secure cash and dramatically decrease both internal and external theft by reducing touch points, while optimizing armored car carrier visits. It's much more than a safe. It's a 24 hour, on duty accountant. VersaSafe, when used with VersaLink remote monitoring software, is constantly examining transactions and events. It can report deposits and the status of each cassette anytime, using your smart phone or any web enabled device. VersaLink can also be set to notify your cash transit service for a pick up. Provisional credit can reduce the float time associated with cash deposits to about 12 to 24 hours. With provisional credit, once cash is deposited into the VersaSafe, deposit data is transmitted to the financial institution, typically once per day. Provisional credit is extended to the retailer even though the funds securely reside within the VersaSafe. 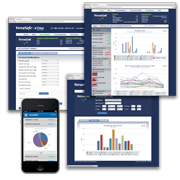 With a color display, a simple interface and speech feedback, VersaSafe makes it easy for you to customize its functions to ﬁt your business. It tracks and timestamps every transaction, increasing both effectiveness and efﬁciency. A high-capacity electronic journal even stores thousands of individual transactions and user histories for easy reference. The VersaSafe features a Microsoft® Windows® graphical user interface presented on a 5.7 inch LCD. The Windows layout is both intuitive and appealing. Another unique feature to the VersaSafe is the on-board 60 mm thermal printer. However, reports do not necessarily have to be printed. The VersaSafe features the ability to export reports electronically to a USB device. This data can be then imported into various programs such as Excel® for easy manipulation. Coupled with VersaLink, it can report deposits and the status of each cassette anytime, using your smart phone or any web enabled device. Finally, the VersaSafe features a modular, no-tools service philosophy where the entire control panel can be removed and replaced within a matter of minutes. The Triton VersaSafe features a number of hardware and software security measures to help ensure the security of both your investment in a smart safe and your investment inside the safe. Triton is the only smart safe manufacturer certified to the UL 291 Level 1 attack test. This requirement covers the construction and security of the VersaSafe and provides for a degree of protection against unauthorized removal of currency within the VersaSafe. Triton’s UL 291 Level 1 certified vault is constructed of ½ inch thick steel on all six sides and features a patented anti-theft door design. Beyond the construction of the vault, Triton offers a variety of UL-listed, high security vault door lock options, which offer dual custody and one-time-use passwords. The cassettes within the VersaSafe also feature high security locks that can be customized. The VersaSafe also provides mounting provisions for additional security equipment such as duress, thermal, and seismic sensors, which can all be tied into existing building security modules. From a software perspective, Triton ensures the integrity of your hardware and data. For instance, the desktop of the Microsoft® Windows® operating system is locked, meaning no one can access the system. Additionally, and in an effort to protect the system against malicious software, all software files loaded on the VersaSafe must be digitally signed by Triton. This ensures that only Triton-approved updates are installed. Whether the VersaSafe communicates with VersaLink using hard-wired Ethernet, Wi-Fi, or wireless, all communications are protected using SSL. Secure Socket Layer (SSL) is a cryptographic protocol that provides communication security over the Internet. SSL uses asymmetric cryptography for authentication of key exchange, symmetric encryption for confidentiality, and message authentication codes for message integrity. SSL is in widespread use in applications such as web browsing, electronic mail, Internet faxing, instant messaging, and voice-over-IP (VoIP). The SSL protocol allows client-server applications to communicate across a network in a way designed to prevent eavesdropping and tampering. The VersaSafe initiates all communications, meaning all traffic on customer local servers is outgoing. In doing so, you don’t have to provide openings in your firewall to allow incoming traffic for the VersaSafe. Environmental controls, including measures to mitigate the risk of service interruptions caused by fire, floods, and other forms of natural disasters. The VersaLink servers are both SSAE 16 and ISAE 3402 compliant. Together, these two standards have replaced the former SAS 70 auditing standard. For the facilitation of provisional credit, VersaLink supports a number of secure data transfer methods. For example, VersaLink can be configured to automatically provide provisional credit data in a number of file formats (e.g., HTML, XML, XLS, CSV, etc.). This data can then be provided on a secure FTP site (SFTP), again, ensuring that financial institution servers are not endangered or compromised with the opening of ports to allow incoming data traffic. The Triton VersaSafe and VersaLink are also supported by a number of third party software providers, which also facilitate the award of provisional credit. With a color display, a simple interface and speech feedback, VersaSafe makes it easy for you to customize its functions. It tracks and timestamps every transaction, allowing you to be more effective and efﬁcient than ever. A high-capacity electronic journal even stores thousands of transactions and user histories for reference.